You did well on your build. That is a very good looking boat. I'd bet that your children like it too. Do you like to fish? What kind of water do you paddle on (streams, river, lake)? the river. So far my daughter's too small a swim. It's interesting to see kayaking around the world. Those little hunting boats (kayaks were originally a stealth, hunting boat) have spread all over. This fellow has muscles, not like us geezers. Nice looking stream hes in there. Don't worry about making mistakes. Do like most of us and do the best you can with what you have to work with. What kind of fish do you fish for? I have fished for pike. I can not boast of great catches max 7kg. (15.43lb) :? Morning Nemunas rivers on the island. The last picture looks lke it was taken from inside a tent. So you are a camper also? There is nothing wrong with catching a 15 lb. fish. That must have been fun. This one I like to travel down the river everything I need fits into a kayak. Then you are a better packer than I am. I started out backpacking. When I started canoeing, I thought, "Boy! Room enough here for 4 to six backpack packs worth of gear!" Individuals do not need much. Viliusce sez, "Individuals do not need much." Well, some don't. And, when I was younger that statement was truer. A few items that have migrated off the not-so-necessary include: scotch, cigars, camp stool, folding table, really thick air mattress, a second cooking pot, binoculars, folding pruning saw, water purifier (notice how far down the list that is compared to scotch? ), folding shovel, rain gear (inexplicably, it never used to rain on camping trips when I was younger), scotch, maps & GPS, etc. Looks like my yak when I am on a trip. Canoe or Kayak camping is when you load the boat with the necessities and then follow up with the luxuries for the trip. Most of my canoe trips I have two (Large ) packs and sometimes three along with a food box. Canoes or kayaks do offer a person a lot more of the luxury camping items for the trip , even a Coffee Pot. Oh, I don't take any luxuries. Only real necessities, and routine necessities. It is my next kayak will be higher. What project you propose? Since you have a really great experience. Not that much experience with kayaks , it seams that the ones I make , someone else ends up with. I managed to keep a couple for some trips but they still ended up with them and not with me. It could be my fault since I prefer an open boat , it is easier for these old bones to get in and out of plus packing the boat for a trip is a lot simpler. I would like to make some suggestions but the way I feel about them is that boats are like cars , they are a personal preference just like tents , sleeping bags , cooking stoves , clothing or anything else that is personal. Matt or Jack would be a lot better at making suggestions about kayaks then myself. Villusce, hitch hiking on Chuckie's comments, kayaks are better on open water than are canoes. 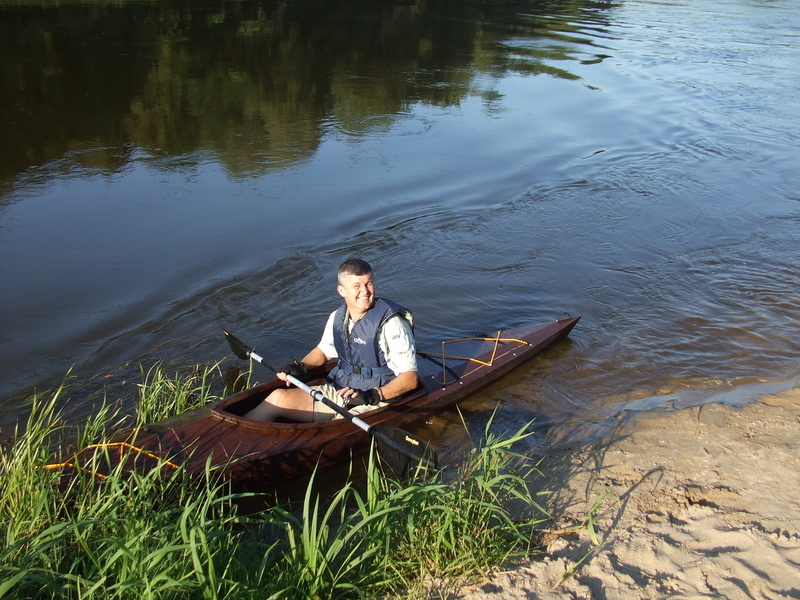 Kayaks were originated to be a stealthy, hunting boat on rough, open waters with large waves. That's why enclosure was so important - to keep water out. Canoes, on the other hand, are a bit more general purpose in design. Canoes will not survive in rough waters that kayaks thrive in. BUT, canoes will carry people and cargo on inland lakes and rivers very well. Chuck has called canoes, "the pickup truck of the outback". That is a good description of this native craft. While some hulls are of a specialized design for specific jobs, most are designed for a cluster of general purpose uses. So, if you seek a boat for inland waters, let's say Class I and II, then a canoe will likely satisfy most needs and wants. A kayak, on those same waters, is more of a sport or play boat, not as good a cargo craft. All that being said, I suggest that you try many hull designs and styles, settling on what you like best, and forget everything else that I said. Higher sided kayak equals more wind interference. It's all about trade offs.